Hey, do you remember that plot contrivance that you don’t remember from like six weeks ago, when Jamison had a prophetic dream about Quentin’s death? In the dream, the ghost of Quentin appeared to Jamison’s grandson David, and gave him a handful of story points. David asked what the three things were, because he has good manners, plus what else are you going to say. So that was extremely informative, as prophetic dreams go. It’s not the thing I would have done, if Quentin showed up in one of my dreams, but I suppose people have different priorities. The first clue about the silver bullet happened right away, by the end of the dream episode, but then they took a break from that storyline to figure out how to extend Barnabas’ crowd-pleasing journey to 1897. Six weeks later, we finally catch back up with it, and Julianka — the one person who could have saved Quentin, by releasing him from the werewolf curse — has been murdered by an unknown assailant. As expected, Quentin takes it personally, and adds this death to his own list of hardships. He has a little soliloquy about hope and failure, and then he walks back to Collinwood to drink brandy and hit on the domestics, which to be honest is probably what he was planning to do anyway. Barnabas recognizes this moment as the second item on Quentin’s mortality checklist, and realizes that he doesn’t have much time before Quentin dies, and turns into the angry specter who’s destined to haunt the family estate in the 1960s. Barnabas takes that personally, too, and he moans to his gypsy servant Magda about it; this is how rich people process a setback. He wishes that he could know when the third event would happen, so that he could be prepared for it, but Magda reminds him that even tea leaves and tarot cards have their limits. This is an unbelievably reassuring thing to say, and I invite all of you to use that line of reasoning exclusively from now on, whenever you have to comfort somebody. That’s a showstopper, reassurance-wise. Luckily, Grayson Hall’s job is to pretend that she’s following whatever Jonathan Frid thinks he’s saying, and she’s terribly good at it. She knows that if you just furrow your brow a little and wait, then eventually either he’ll say something sensible or the scene will end, whichever comes first. “I would give anything to go back to there for ten minutes,” Barnabas says, meaning the future. So do you remember that plot contrivance that you don’t remember from eight months ago, when the Bride of Frankenstein traveled back to the 18th century to save Jane Eyre’s boyfriend from the Salem witch trials? Of course you do, everyone does; it’s one of the great moments in the history of the dramatic arts. While she was there, she got ahold of the Collins family history, a radioactive time-traveling MacGuffin that Vicki left in the courthouse, one hundred and seventy years before its publication. Eve snatched the book, for no particular reason, and brought it with her when she returned to 1968. Or, as Barnabas explains it today: “You see, Vicki took that book back to the 18th century when she went there, and so Eve brought it back to the present.” Puzzled, Magda asks, “When did she take the book?” and Barnabas says, “Not too long ago,” which okay then. Ordinarily, a baffling continuity reference like this would just be a weird throwaway line, which nobody actually expects the audience to follow. But this time, they’re doubling down on it so hard that it cracks the world. And here it is, at last: the moment to literally end all moments. 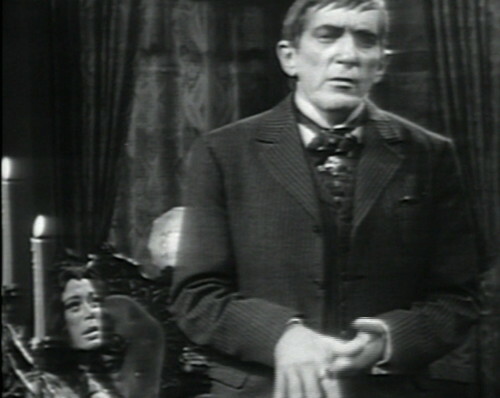 Barnabas: Magda — I said that it didn’t happen too long ago… but that hasn’t happened yet! There’s still a chance that we might be able to save Quentin! Barnabas: Because by looking at the book that lies in the old colonial courthouse. That’s what he says, “because by looking”. That is not the silliest thing he says today by a long shot. Magda: But you said that Eve took it! Barnabas: She did — which happened in 1968, which hasn’t happened yet! So if I’m correct, then the book is still in the courthouse right now! And then they start arguing about who’s going to go and find it. Barnabas’ analysis of the situation has been accepted, and everything from here on is just tactics. And it works! Magda goes to the courthouse, and she finds the book — this impossible, unacceptably time-jolted volume that shouldn’t be anywhere. It turns out that Magda was right, 1927 will never arrive, because we’re trapped in a recursive time corridor running between 1795 and 1967. If I understand this correctly, the Collins family history book is here because it hasn’t yet been about to be took back from a time when it already shouldn’t have had to have been going to be brought in the first place. I believe this tense is called the subjective pluposterous. This is weapons-grade meanwhiling. Even Vicki couldn’t have come up with this, at the height of her tenure as the ambassador of Faction Paradox. And guess what? The book doesn’t even have the date of Quentin’s death anyway. There’s just a note that says that Quentin left for a voyage around the world, which is Collins code for turned into a monster and killed the entire family. 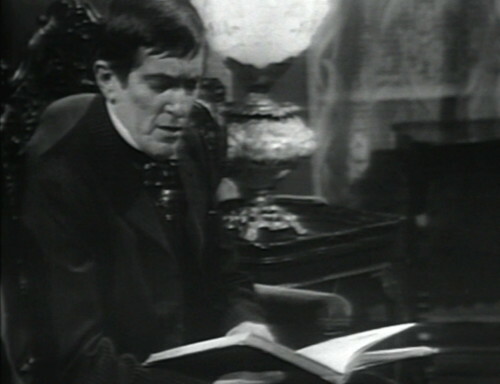 Barnabas puts the book down in despair, and then they just start talking about something else. This entire continuity reference lasts for less than two scenes. Look what a mess they’ve just made of linear time, and they didn’t even get a plot point out of it. 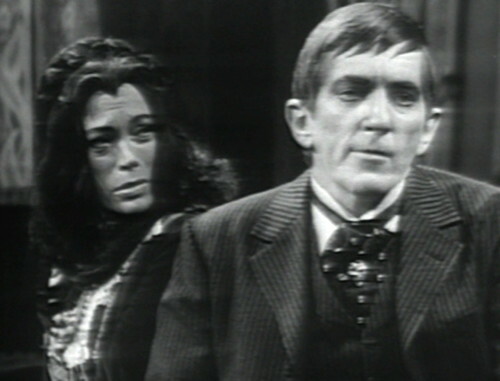 So it has to be said: Dark Shadows is not a science fiction story with a coherent theory of time travel. It’s just a story about a group of people who happen to spend every waking minute talking about time travel, and whatever they say about it is true, until they change their minds. From now on, if the phrase “from now on” still means anything, time on Dark Shadows is utterly and irretrievably broken. 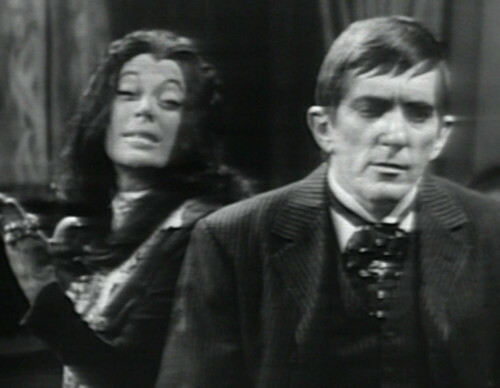 Anybody in the audience who still thinks that it’s necessary to explain any continuity error on the show: maybe watching Dark Shadows is not for you. Seriously, this is the end of retcons forever. No mas. Tomorrow: Everyone You Love Must Die. Magda reads the book: “Before the year 1875 ended, Quentin Collins left Collinsport for a voyage around the world.” She means 1897, of course. You could actually say that this just proves Magda can’t read very well, but she reads “before 1897 was over” a moment later. 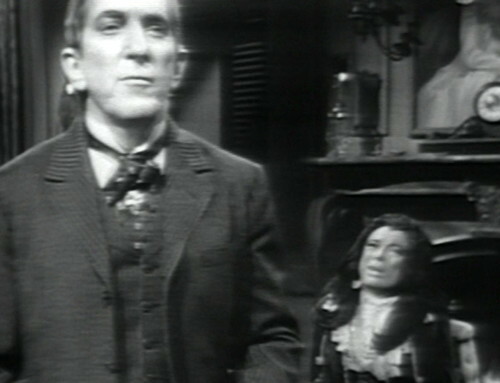 Then she coughs while Barnabas is talking. Quentin and Beth are listening to Quentin’s theme while he gets drunk, and the scene is long enough for the song to end and start over again. Could you put wax cylinders on shuffle like that? 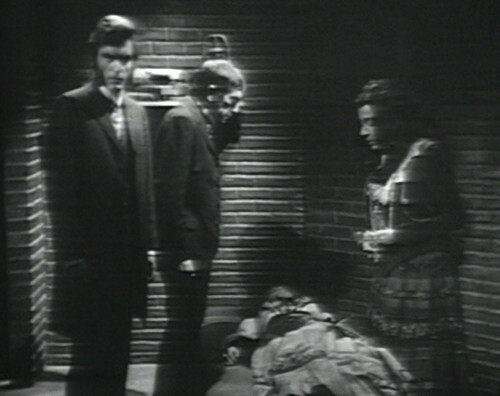 The video master for this episode was lost, so what we see on home video is a black-and-white kinescope copy, made by pointing a camera at a television set during playback for distribution to network affiliates who run Dark Shadows in a different timeslot. This episode was skipped in syndication, because Worldvision didn’t realize there was a kinescope available, but a copy was found by MPI for the home video release. It was an annoying episode to miss when we were watching the show on public TV, because they finally got around to showing the second event from Quentin’s list, and we didn’t even see it. There are three more kinescope episodes left; the next one is 813. This is the last of Diana Davila’s four episodes as Julianka, and it’s a shame because I’ve hardly even mentioned her. Davila was much more active on the stage than screen. Her only film role was in the Woody Allen film Play It Again Sam, where she plays a girl that Woody Allen’s character talks to in a museum. Her Broadway career included roles in the Tony-winning shows The Prime of Miss Jean Brodie and Two Gentleman of Verona, as well as three huge flops: Song of the Grasshopper, Home Sweet Homer and Stages. They weren’t her fault. Quentin isn’t very pro-active about finding a cure for his curse. He’s content to sit around getting drunk and listening to his record player while Barnabas, Magda and Angelique scramble around trying to save him. Why doesn’t he go to the King of the Gypsies – since he’s right there in Boston – andpersonally ASK for help. Quentin’s so lazy, he won’t even find a place to lock himself away while he’s in wolfman mode – we know the basements of Collinwood and the Old House have all kinds of sturdy, securable cells – Barnabas could lock him up while the moon is full and cut down on the body count, at least. Adam couldn’t bust out of that cell in the Old House – I think the Werewolf would be hard pressed to escape it, too. What you say about Quentin is true, and certainly he could be locked up on nights of the full moon. But that doesn’t solve the entire problem. He’s turned into a werewolf when there wasn’t a full moon a couple of times now due to various interferences, and Quentin is often fatalistic about it, knowing he could turn into “the beast” at any time. That’s at least partially why he’s so insistent that Beth go far away from Collinwood in this episode. 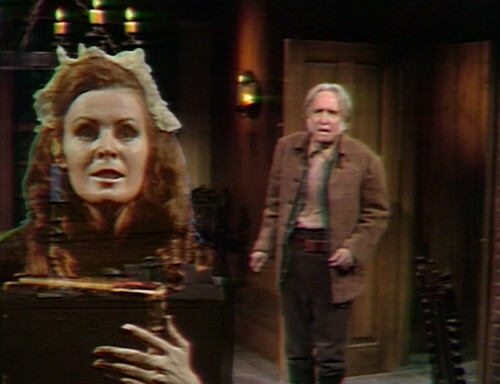 I had no idea who Eve and Vicki were, and I am ashamed to say that Barnabas’ logic made sense to me the first time I saw this episode. I was a casual viewer enjoying a funky 1960s spook show during summer vacation. Now even thinking about Barnabas’ logic hurts my brain. The fact that someone wrote down that line and got paid for it is actually what really hurts. And as you so eloquently point out…THEY DIDN’T even get a plot point out of it!! 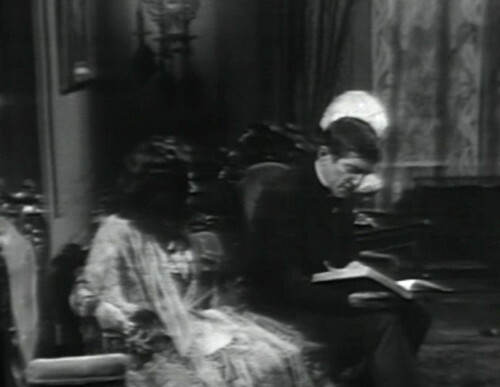 That being said…there’s something a little extra “spooky” about the black & white episodes, especially this one with the ghost effect. And I’d have loved more Julianka or the actress in another role. Too bad we don’t get to see her descendant during the 1969/1970 stories. I think when I first saw this episode, I tried to flowchart Barnabas’ “theory” of how time worked. The flowchart was not a success and I just gave up. I would occasionally read articles written by fans who tried to explain inconsistencies– why Barnabas was lying in his coffin with his head towards the secret door in one time period and his feet toward the door in another. I decided not to care, because time travel on the show did not make sense, so I just decided to love the show in spite of what Danny refers to as the subjective pluposterous. Several years ago, I purchased the two seasons of Time Tunnel on DVD. Among the bonus features was an unaired remake pilot which, I thought, was quite good. The scientists at Time Tunnel central could monitor the percent of change caused by the presence of the time travelers in another era and would work to correct any deviation from the original timeline. There was an understanding of butterflies flapping their wings and fractals and that sort of thing. I love that this episode is in black and white, really enhances the spookiness. I also,love how they get right to the seance without the usual back and forth, let’s have a seance, no that would be a waste of time. They just sit down and do it. Diana Davila is great! Too bad they couldn’t use her more. Hey Danny- This post on time travel made my head hurt…but damn, you are hilarious! Just want to thank you for this blog – it’s the best and never fails to make me laugh out loud. So happy to have stumbled upon this motley crew of DS fans who share a similar, inexplicable fasciation and affection for this crazy show. The person that wrote that line is my hero… for giving me such a nice chuckle! God bless you, whoever you are!!!!! I liked that line, too. I was only disappointed that she didn’t get to elaborate on it a bit. The book is there in the courthouse in 1897 because Eve hasn’t traveled back to 1796 from the 1960s to take it back to the 1960s. But Vicki hasn’t traveled back to 1795 from the 1960s with the book yet, either, so the book shouldn’t be there. But it is. So how many timelines are we screwing up here? There’s the original (Phyllis Wick line); the first rerun (Vicki line); the second rerun (Eve line); the ‘original’ 1897 (Barnabas-less line); the first 1897 rerun (Barnabas line); and we haven’t yet traveled to 1840, which will add another rerun to the 1897 rerun (Edith paradox line). There may be some lines I haven’t mentioned, but my brain is getting sore. It’s easier to just blame it all on Vicki, since she started it. you all realise, of course, that the people writing comments, and inserting them, are also rather, travelling in time. now, isn’t that ever so appropriate?